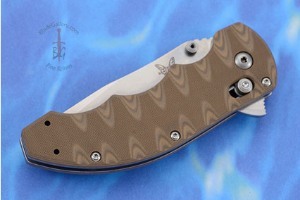 Description: The 300SSN is Benchmade's very first flipper, a stout Butch Ball design that looks great and feels solid in hand. 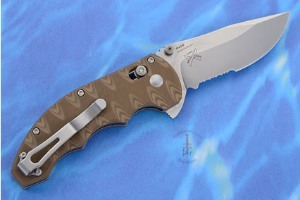 The flipper allows for super-fast one handed opening with just a flick of a finger. 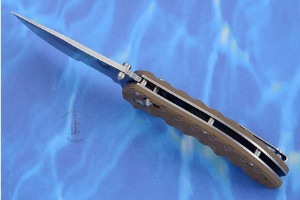 In the blade-open position, the flipper also acts as a guard, helping prevent your hand from slipping down onto the blade. The blade is a partially serrated, 154CM stainless steel, drop point with a swedge on top and ambidextrous thumb studs. 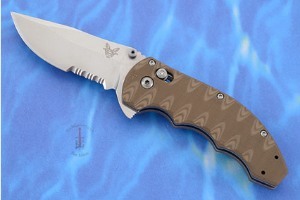 The handle features skeletonized steel liners with textured tan and brown G-10 scales. Staggered grooves in the handle not only enhance the grip, but also show off the multiple layers of different colored G10. 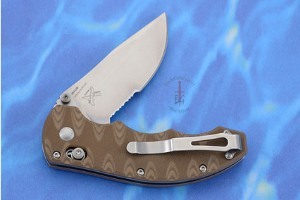 Includes a deep-carry, reversible, tip-up pocket clip. 0.2978515625 0.1103515625 297.8515625 110.3515625 Trailer Completed.